Tracing its roots back to Japan, Bon Odori evolved out of the Odori Nembutsu, a popular Buddhist chant and dance from the late Heian (794 – 1185) and Kamakura (1185 – 1333) periods. By the 1600s, it became widespread and very popular in rural communities, providing a break from farm life. During the Meiji period (1868 – 1912), Bon Odori was banned, as it was thought to encourage immoral behavior, especially among the young. The ban was lifted during the Taisho period (1912 – 1926), and new songs and dances were created, combining Western instruments with traditional Japanese ones. In 1934, the song “Tokyo Ondo” became a hit. 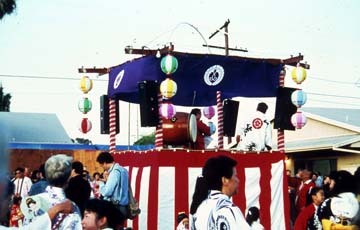 During the 1950s through the 1970s, Bon Odori became a traditional feature of Jodoshinshu temple Obon events, usually scheduled from late June through August. Dances were simplified, with a returned emphasis ofBon Odori as folk dances, with temple members now responsible for choosing and teaching the Bon Odori dances to their congregation. Bon Odori in the United States has a far stronger spiritual connection than it does in Japan today. Ironically, the Buddhist basis of Bon Odori is found almost exclusively in Jodoshinshu temples in the United States, and not in other sects of Buddhism, while the opposite is the case in Japan. TheJodoshinshu sect rejects the notion of “souls” returning at Obon, and thus, in Japan, Bon Odori is ignored. In the United States, the idea of souls being placated or welcomed is not connected with the idea of Obon in Japanese American Jodoshinshu temples. Photograph by and courtesy of Kevin Higa. Bon Odori emerged from the tradition of popular religious and folk music, with two styles of music: bushi, or folk songs, and ondo, folks songs influenced by the Goeika (religious chanting with bells). It was not until post-WWII that “ondo” was referenced to street dancing among some Japanese Americans. 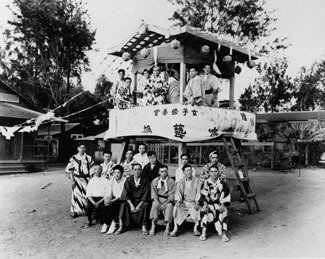 The song, “Bon Odori,” which is the first and last dance at most Bon Odoris, was written in 1934 by the Buddhist Music Association of the Honzan (mother temple) in Kyoto. The combination of folk melodies and dances form different types of Bon Odori, usually accompanied by instruments such as hand clapping, taiko (drum),atarigane, fue (flute), binsawa (wood rattle), and shamisen. Most dancers can be seen wearing a yukata, a lightweight, summer kimono, or a happi coat, a short kimono-like jacket. While associated with Buddhism, Obon is celebrated and embraced by all, regardless of one’s religious background. Buddhist temples schedule theirObon events over the weekends from late June through August. These festivals are well attended, drawing large multi-generational and multi-racial crowds. Each temple’s festival is unique, but most generally feature carnival games with food booths serving traditional Japanese and Japanese American fare—sushi, udon, dango, teriyaki—as well as local cultural favorites, such as tacos and tamales in many Southern California celebrations. We encourage you to experience the many Obon festivals throughout your community, then tell us about your own Obon experiences atDiscoverNikkei.org.